This blog is going to be a shock for people who know me well. My wife had a mild heart attack and other family members are still laughing so hard that we are contemplating medical measures. Cooking, I am told, is an art. And I am becoming an artist these days. For more than thirty years of my life, I had only cooked stories and numbers. I STRONGLY believed that cooking food is a waste of time and effort. I looked forward to the day when eating food would mean taking a few tablets. I maintained that I would rather die of hunger than cook for myself. I have lived alone on many occasions (in India!) and never considered cooking. Time is one of the best change-agents © (Now that is an original quote and I intend to patent it. Any attempts at copying this without my written permission is illegal). People change, circumstances change, opinions change, beliefs change, over time. So 'time' (read 'health') has made me cook in the past few months since I reached US in early 2008. I started off with ready-to-eat and easy-to-make stuff like noodles, pasta, french toast, omelette, upma, seva, dal, etc. And over the last few weeks, I have graduated to attempt my hand at dishes like potato subji, tomato curry, green peas masala, etc. 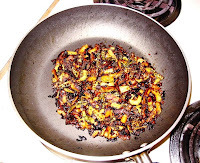 However, what gave heart attack to my wife was when I wanted to make bitter-gourd ('karela') fry this week. This is because I have never eaten bitter-gourd in my life, which is four or five times, without pouting and blaming my family of conspiring against me. Fortunately, I was able to give her cardiopulmonary resuscitation (CPR) virtually since we were chatting on Skype when I popped the question. I chose it because I eat my rice with curd and pickle and was thinking about options that would go with it. I had also got tired with eating potatoes and tomatoes only. My first attempt at bitter-gourd was not that bad, though it did get slightly burned (picture attached). Considering that I hardly had any prior experience or inclination in cooking, I have made significant progress in the art of cooking (read 'culinary skills'). Therefore, I claim to be the upcoming artist to watch for. Bitter-gourd fry may be one small step in the eyes of people who know me, but it is one giant leap for me! but whats bitter gourd btw? Thank you. You may know bitter gourd or 'momordica charantia' as bitter melon. Salil & cooking - boss, I swear - you should be out of the country to prepare your best dishes.. Though I did touch the gas stove for 5 years in Mettur, I became an expert in cooking aloo sabji, sambhar / rasam. But, ultimate was tasty curd rice with pickle imported from India !! Can't wait to have food cooked by you while you were in India - btw, I've asked my agent to increase my mediclaim Sun Insured.. Hope I need not go for life insurance. Are you sure you want to do that? Even Ambika has not dared. I graduated from curd rice & pickle after 3-4 months. Went thru most of your posts and found them interesting, especially the way you write! Anyways looking forward to more posts from you. Nice to see you passing by and thanks for the encouraging words. Salil & Bittergourd combination incredible!!!!! a) You know dinner is ready when the smoke alarm goes off. b) Your dog goes to the neighbors' to eat. c) Your family seems really interested in going to that restaurant that always has trouble passing the health inspection. d) When you barbeque, two of your kids hold water guns and the third has the phone with the emergency number on speed-dial. e) 'Pest control' companies keep pestering you, wanting to buy and patent your candy Christmas cookies recipe. f) Your homemade bread loaf can be used as a door stop. g) The last time you tried to make toast the kitchen caught on fire. h) You look in a cookbook to find out how to boil water.